There is a slight irony around my love of point & click adventures over the last few years. Back in the 8 and 16 bit days I would often pour my disdain on these games while proclaiming the superiority of the good old text adventure. I was willing to accept the static images that accompanied games like "The Guild of Thieves" or "The Boggit", but controlling a pixeled character and clicking on things with a limited set of verbs? Leave it out. It wasn't until sometime around 2006-ish that I started to dabble in point and clicks, but it was the launch of iOS (especially the iPad) where my love of them was cemented. Sam Dyer and Bitmap Books have done an exceptional job with their visual compendium books - beautiful design, striking images and some great interviews being their hallmarks. 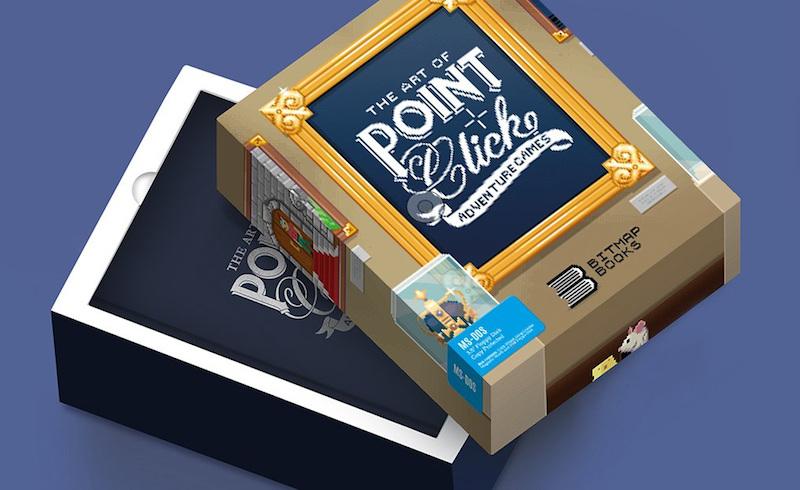 So it's no surprise that I've been eagerly awaiting their new title, "The Art of Point-And-Click Adventure Games". As well as the regular hardback, there is also a Collector's Edition available during the pre-order window. The latter looks like a real celebration of something that helped make those early games so memorable: a good selection of "feelies" (including a code wheel and a grog coaster) included in a DOS-style game box. The estimated shipping date is August 2018.